Beginnings of the East Coast adventure! So I have reached Cairns!!! I feel though I should update from the last time I blogged as I have been really lazy with this. So since I last updated the farm was quite eventful. A few days later I ended up being asked by the farmer to help with mustering the cattle, partly due to the fact that I had been going for runs everyday so he figured I would be good at running away from the cattle if they decided to attack. The cattle up here are not like the ones at home, they are very, hmm, emotional? hehe basically they are easily pissed off and WILL attack. Initially the cattle were in a field and we had to move them into a station thing. I was told, one rule was NOT to die, which I was pretty happy with. If any cattle came charging you had to run for a fence and jump over. While we were moving them one did run for us, the famr said jump over the fence but needless to say I was already well over that fence! He knew I would do fine from that moment. So we were diving the cattle into different groups because they needed to be pregnancy tested. We had to muster them through different gates which was pretty fun. Once they were into the groups they had to go through a gate and into a holding thing to get tested. The cattle did not accept my authority at all. To get them to move you have to walk towards them and then we just walk forwards but they were not having it and I got many an evil stare! 50 of the cattle were tested and only 2 were NOT pregnant so they decided they wouldn't bother checking the rest. Supposedly the bull broke into the field when he wasn't supposed to because its the wrong time of year or something. When they were nearly done the farmer doing the testing asked if I wanted a go, I was like, YES!! So I had to put on this massive glove up to my shoulder and he showed me how to do it. You had to lift its tail up first and hold your hand a certain way then head on in! He was a bit more detailed with me on exactly how to do it but I feel no one else really wants to know. Anyway, I got to feel the wee calfs head!!!!! It was soo incredibly awesome! :) After this the others left and it was only the farmer that comes in to do the cattle and me, he then asked my to move all the cattle down the other side of a field while he was at the bottom and counting them. It was kinda scarey because the cattle kind of turn and just stare at you So i was walking down and every so ofter running back to the fence incase I needed to escape. All in all there were 316 cattle!!! I know! I mustered all those cattle on my own!!! It was so scarey but completely amazing. About 2 weeks later our friends came to visit in their campervan and they informed us that a group of fellas we knew from the hostel in Darwin were working on a farm really close. We contacted them and met up for a catch up in the local 'pub' were we decided to all explore together the next day. Near the farm two places had opened a few days before that had been closed due to the roads not being fixed post the wet season. One was a place beside the pub called the Arches which was a river that had big rock formations you could jump from and swings from trees. The other was a place called Butterfly Gorge which was a bit further awy and you could only get to it if you had a 4x4. The farmer said we could swim in the arches because loads of people do so there probably isnt any crocodiles, but he said he wouldn't swim in Butterfly Gorge. The next day we went to the Arches first, it was so cool. Firstly you jump in and then you have to swim through a tunnel make by rock formations which is kinda if scarey as I imagine its somewhere a crocodile would like to live. Then we headed to Butterfly Gorge. When you get to it you have to walk along a river for a bit then climb around the side of a cliff which is pretty dodgy. You then have to cross the river and you come to this huge Gorge which is absolutely stunning!! The fellas we were with said they had been swimming in it before and it was fine so we just went for it. Firstly you swim in a watering hole and the rocks are so massive above you, then you swimm through a break in the rocks and have to climb through a tiny tunnel where you come to more watering holes and then to a huge one. Everyone were climbing up on the rocks doing really high jumps and dives, I felt like I was in a movie or something. There were all little water holes that were really warm, so we sat there for a while. I can't really explain how amaing the Gorge was, it was ao beautiful and even surreal to be there. I have to say that was probably the best dat I have had in Australia yet. The last week we were working the farmer had BBQ for us all leaving, but it was at a place called Stray Creek which is another river. It was such a typical Aussie BBQ with loads of food and drink. The creek was also so cool because the farmers kids had brought tyres down to float in the river, so we highjacked them! A few days later Clare and I went over to organise all the paperwork for leaving but we ended up staying really late and drinking with the farmer and his wife getting pretty merry. It was so nice just to chat and get to know them though. We also organised that I would come over when the kids got home from work and take a little gymnastics class, which I did. The kids are actually quite talented, its a pity they are in the outback! Leaving the farm was sad because we had such a great experience and had seen so much! I love the family, they are all so nice and friendly and made us feel so welcome. But I feel travelling we need to keep going. We left on the friday and our flight to Cairns was sat morning at 6:20 am so we needed to leave the hostel at 3:30 am. I wasn't intending on going out but of course being in Darwin that was clearly never going to happen. We ended up going to my old work and a load of the ones I used to work with were out drinking. Needless to say it all went downhill from there. I ended up leaving the club at 3:15, sprinting to my room, grabbing my stuff and jumping in a taxi, all while we were pretty merry! Getting a flight under the influence if such a funny and random experience, we were all so unorganised too!!! But we made it to Cairns!!! yay!! We checked into a hostel called Gilligans which is a huge hostel but pretty cool. We couldn't all get into the same room so we were split up. I was in a really noisy room so I changed into Clares room the next day because there was a free bed. For the first 2 days we basically hung about and recovered from the last night in Darwin. On the third say though we rented a car and drove up to Port Douglas (an upmarket seaside town) and to Cape Tribulation which is Tropical Rainforest, Driving through a rainforest is class!! The roads are so windey and there are huge trees all around. The roads are quite thin and if you look over the edge there are massive drops which you would not survive if you went over. 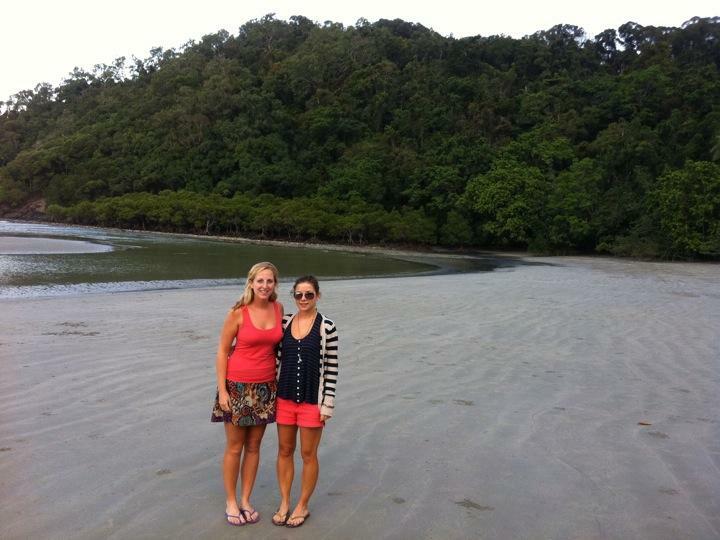 At Cape Tribulation there is a beach that the rainforest meets, it is so beautiful. You can't swim here either though, again because of crocodile and jelly fish, but the view is definately enough. That same day we also organised our camper van to drive down the east coast in, its going to be so fun! Aunty Maura Maeve, I enjoyed reading the blog but my stomach is still knotted!! I spent the whole read waiting for the crocodile to appear. Glad you're having such a great time. Looking forward to the next blog hint, hint!!! Aunty Maura.